A half a dozen years after I started beading, I became a redhead. I stopped wearing pink since it clashed with my hair. I guess I also stopped buying pink beads, because when I pulled out Drawer 16, I was surprised at its sparsity. 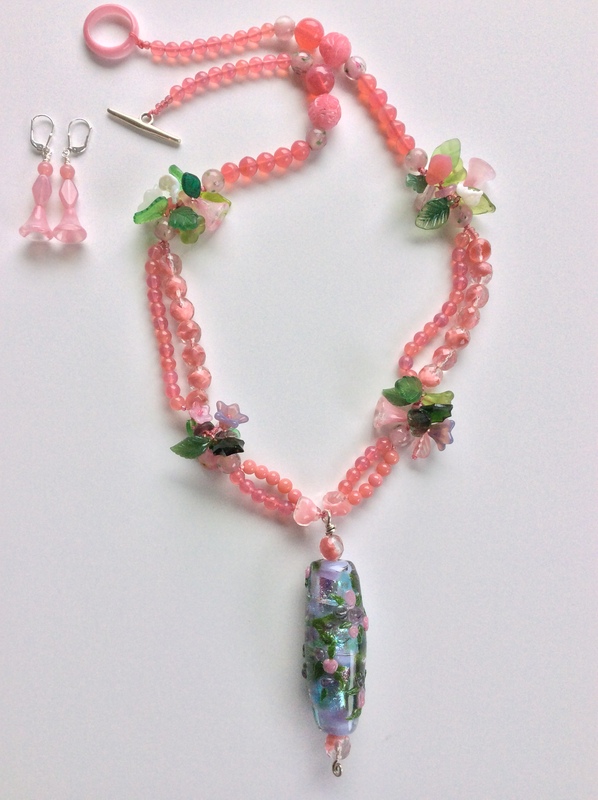 Besides the one bag of pink Czech glass that dominates this necklace, all I had were bits and pieces. 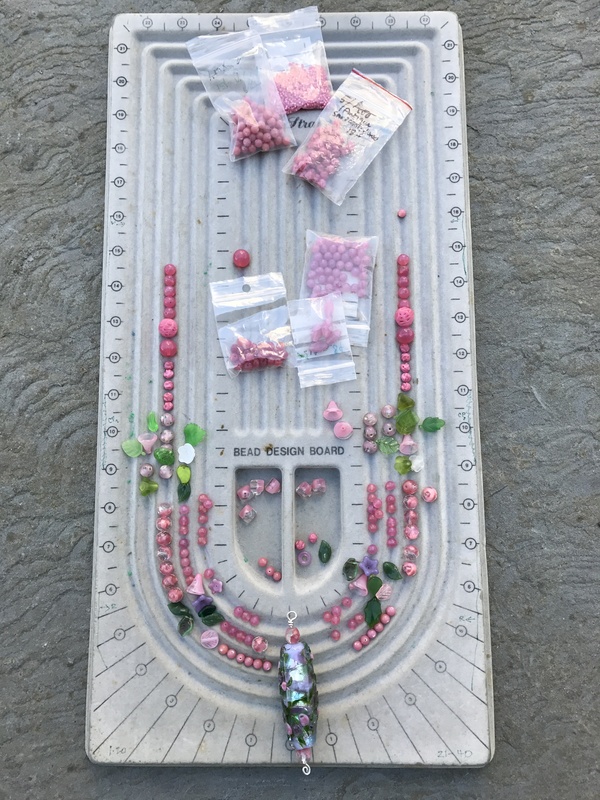 For example, near the clasp, note the two “lacy” round beads and the larger pink ones of the same family as the dominant beads–there were exactly two beads in each plastic bag. Now there are none. 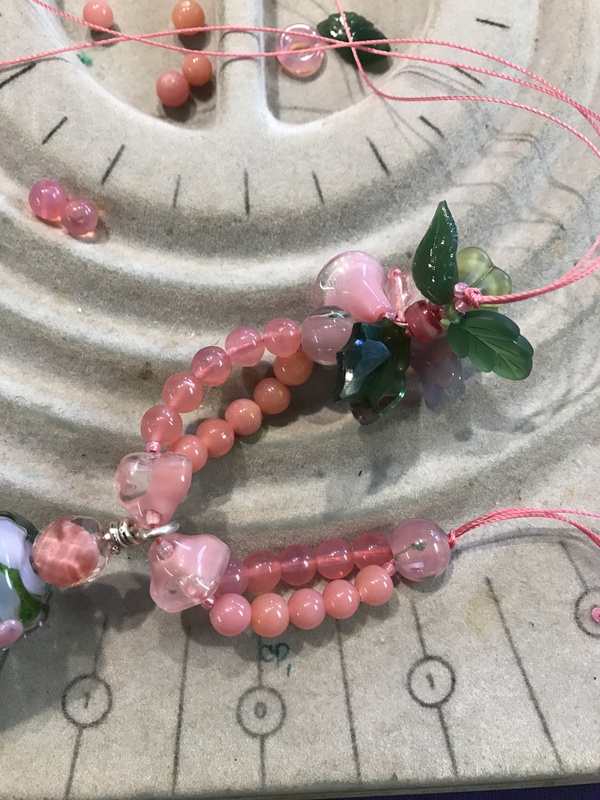 I have many pretty pink beads: the ones with embedded green leaves (maybe dots to your eyes); vintage faceted clear and pink; and the triangular ones near the centerpiece and in the earrings as well. The centerpiece is from my large lampwork glass collection and features pink and lavender roses, er, flowers, with leaves. It measures 2.5” and is a real statement! Riffing off those flowers and leaves, I couldn’t resist designing four clusters of them into the body of the necklace. I wanted each cluster to be unique, so I pulled different shades and styles of leaves and flowers, and randomly assembled them. It took some time and involved close work, but I found the process very satisfying. Finally, the clasp is a pink glass circle with a silver toggle. This is the first and perhaps the only necklace of this Challenge to be strung in thread which is especially adaptable to the clusters in this woven piece. I used three strands on each side to give the three-dimensionality I wanted to the clusters. This necklace is accompanied by earrings using beads from the necklace. It is 26” long plus a 3.5” dangle. $129. Love the details of the process that you did! I need to drop over to your studio to pick up my piece! That is a sweet necklace! Nicely done, Priscilla! Hope spring is bringing you lots of sunshine and warmth! We are still getting snow 😩and now that the ski areas are closed I find it annoying!! Francie is in drivers ed. Can’t believe she’s old enough to drive! I just love this creation. So “Pretty in Pink”! process … a true treat.